Use inactivity timeouts to automatically transfer a visitor to another available agent if the first agent has not replied for some time, make a chat inactive and close a chat after a set amount of time. Thanks to it you can be sure a customer doesn’t get stuck with an agent who is away from their desk and had forgotten to log out. 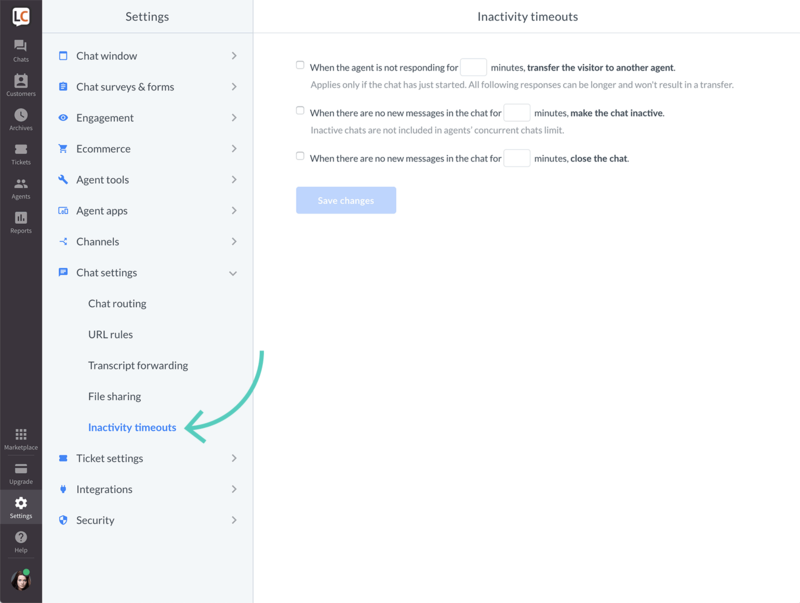 If you are on Team, Business or Enterprise plan, you can adjust the inactivity timeouts in settings. For customers using our Starter plan LiveChat automatically applies default values. 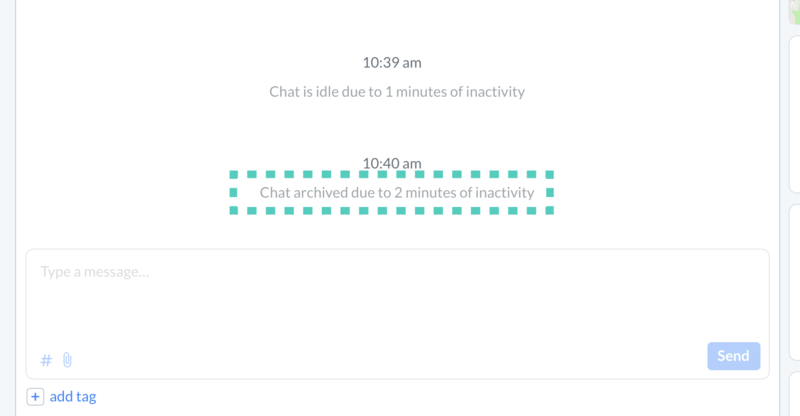 There are three types of inactivity timeouts: transfer the visitor to another agent, make the chat inactive and close the chat. Each one can be adjusted in Settings. This rule applies only at the beginning of a chat (so before an agent sends the first message to a customer). 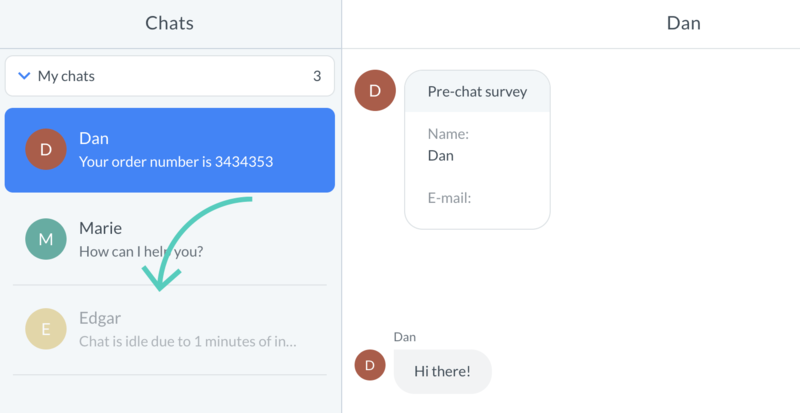 If a customer doesn’t receive a reply for a set amount of time, the chat will be transferred to the next available agent. If the next agent won’t be able to reply either, the customer will be transferred again. But the customer will never be transferred to an agent they’ve already been connected to. If you have a lot of chats at the same time and you want to avoid the transfer, you can always let the visitor know that you will get back to them in a minute. This way, the visitor knows what to expect and won’t get bounced to another agent. Transfer the visitor to another agent rule is set to 3 minutes by default for users of the Starter plan. Users on Team, Business and Enterprise plans can set time in Settings. This rule applies when a chat has already started (both agent and customer sent at least one message). When both sides don’t send any messages for a set amount of time, the chat becomes inactive. All inactive chats are greyed out. If a customer messages you, the chat becomes active again. Inactive chats don’t count towards the maximum number of concurrent chats an agent can have. Which means that sometimes an agent can end up with more chats than their set limit. Make the chat inactive rule is set to 10 minutes by default for users of the Starter plan. Users on Team, Business and Enterprise plans can set time in Settings. When both sides don’t send any messages for a set amount of time, the chat is automatically closed. You can still see it on the chat list, but it will be greyed out, and you won’t be able to send any messages. You can set the time it takes to transfer the visitor to another agent, make the chat inactive or close the chat by adjusting inactivity timeouts. Log in to LiveChat. Go to Settings → Chat settings → Inactivity timeouts. Check the box next to the rule you want to turn on. Set the time (in minutes).